This one is a little bit of a back blog so I will keep it short...Just before the winter we did a last trip out of town to see the last of the famous multicoloured leaves of New England. We took the scenic coast drive up to Rockport a little town famous for the picturesque little red house on the bay often seen in movies and photos. Freezing and hungry we quickly ducked into The Bean & Leaf Cafe located at the entrance of Bearskin Neck and warmed up to a bowl of New England clam chowder with some oyster crackers. The chowder was very creamy with some nice chunks of potato and clams. It comes with the usual oyster cracker but some freshly baked bread would not have gone amiss. 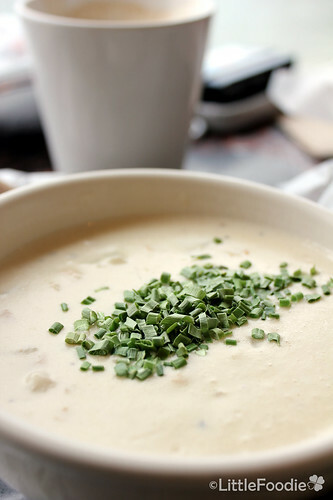 I haven't tried the chowder at Neptune Oysters but would be great to compare. 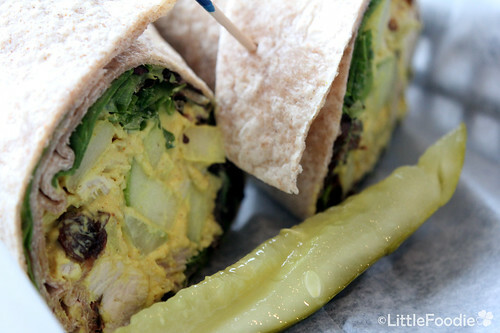 We also tried the curry chicken wrap which is filled with pieces of chicken with cucumber and baby spinach. The place is more a cafe then a restaurant so there is limited seating but if you do get a seat you will enjoy a quiet serene view of the bay. And as cafe goes this is probably one of the best I've been to in Boston + extended areas. I find most of the inner city cafes to be limited to the generic muffin and bagels and it is nice to be at a place that provides a bit more variety. Food: Bayside cafe with wrap and sandwich menu as well as various cakes and cookies. Further up Bearskin Neck as you head out to the lookout there is a nice little strudel place to the right. Helmut's Strudel is home of amazing freshly baked strudel and other delicious pastries. 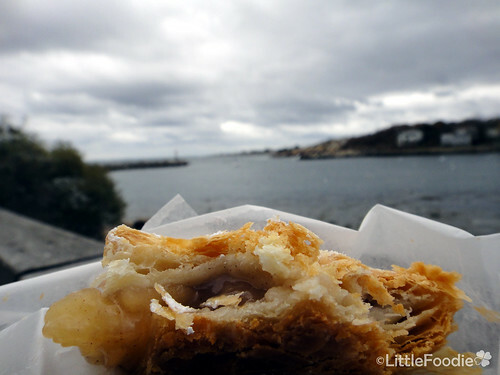 This is my half eaten apple strudel with the cloudy bay in the background. They have other strudels and croissants and the usual findings of a bakery but the strudel is the most famous and I never leave without taking one home! Setting: Small bakery with indoor and outdoor seating. Damage: Cheap except you will be tempted to eat and buy a lot of strudel so can end up been expensive.